Rolling through the Strangeland of charts. Released as a charity single for the U.K. group War Child, “Sky” quickly rose up the chart, only to crash downward. It was deemed ineligible to chart in the U.K. because of an added poster in the 7″ single sleeve. The title track from their third album was the first to miss the top 75 in the U.K. and failed to go top 40 in any one country. It was perhaps due to a shift in sound for the band into a more 1980’s synth-pop realm. The Fortune Teller was foreseeing cloudy skies with this release. Although it did moderately well in Europe and on my personal chart, it wasn’t exactly their biggest hit. Two non-top 20 singles followed this one. This era was the only one for the band that didn’t feature a first single going top ten, though I do like the song quite a bit. It was also one of their last singles to receive a physical release in some European countries. The third and final song to make my chart from the band’s latest album ended the era on a high note, reaching as high as #8 that fall. It managed minor peaks on the official surveys of Belgium and The Netherlands. Ah, yes, the debut single. Back in the fall of 2004, “Know” quickly hopped up to #7 before sliding down the chart before the year was over. Needless to say, this smash hit is most definitely their signature song. Though this second single from their first album peaked at #6, it spent 24 weeks in the top 40, the second longest run for any of their songs on my chart. A new radio mix of “Changing” accompanied its release. “Minute” is their only collaboration thus far to make my top 40 and, so far, is rapper K’naan‘s only appearance to date. It was their first official single in four years to reach the top ten, peaking at #4 for a week. At the time, this was the band’s biggest by far on my chart, spending two weeks at #2 behind Daniel Powter‘s “Bad Day”. It remains tied as their highest charted position in the U.K. with “Know”, peaking at #3. If you follow my chart, there’s no surprise that this song ranks up here as my favorite. It was just last year that Keane scored their first #1 single on here, which also did well at AAA radio here in the States. The four-week reign stretched from mid-May to mid-June, and after spending half a year in my top 40, it ranked as my #12 song of last year. We’ll see if a new single from The Best Of Keane can top this very soon. 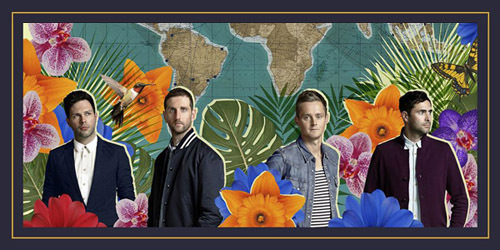 For more on the band Keane and everything keen in the music industry, follow the blog below or hit the “Get Social!” tab to find out how you can connect with PGTC on social media.